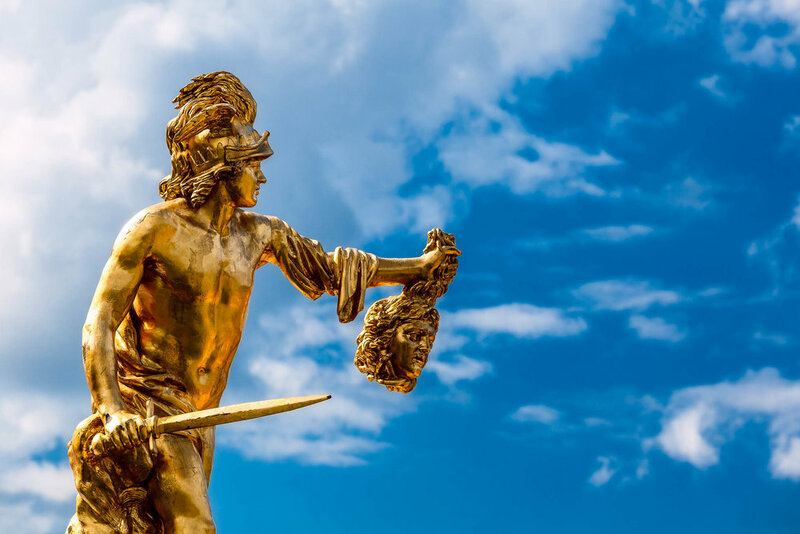 A golden warrior statue holding the head of a victim in the grounds of Peterhof Palace near St. Petersburg, Russia. It’s around this time of year that I hear folks bemoaning how disappointing summer has been for them down here in Australia. Given that we’ve just experienced another very hot, record breaking summer you have to wonder about the validity of such statements. I love the longer, warmer days at this time of year. However, after a week or two of more moderate weather, with lovely cool evenings, we’ve hit another very hot spell. There are numerous bushfires ranging close to the edge of Melbourne, where I currently reside. What’s more it looks like autumn, by favourite time of year, is going to be warmer and drier than usual. While most of my photography is undertaken when I'm travelling, the longer daylight hours at this time of year do make it easier to get into the air and light most days, even if it’s just for a little light exercise. And that’s as good for the mind as it is for the body. There's little better in life than being almost completely immersed in a creative project. Over recent years the projects that have filled my time have been centered around improving this website and running a variety of online photography communities. It’s been a blast. However, working very long hours for months at a time can be problematic. And that’s particularly the case when most of that work is done on a computer. The trick is to ensure you get out and about in the light and in the fresh air, each and every day. That's the kind of balance, I suspect, we're all aware of, but rarely seem to achieve. Am I right? A family make their way into a subway on a cold winter's day in Harbin, China. I do feel that summer seems to pass quicker with each passing year. We all work long hours, and many of us work seven days a week. But that’s all the more reason to make the most of it by getting out into the air and into the light whenever we can. Now that, officially, autumn has begun in this part of the world I’m reminded that, with each passing day, winter is coming. A most spectacular scene as the Jökulsá á Fjöllum river cuts its way through the rugged landscape downstream from the incredible Dettifoss Waterfall in the Vatnajökulla National Park in Northeast Iceland. I've been blogging intensively since January 1, 2009. You’d think I’d have it down pat by now. But I’m the kind of person who tries to do what they do as well as they can. That makes it necessary to take a step back, every now and again, to reassess what I’m doing and how I’m going about it. It's important to break the mould and move away from your usual daily rhythm every now and again. After all, how else would you know whether you're using your time well and making the most of your opportunities. But how do you make changes when your life is built around the routines associated with content production? For me it’s about taking action to break the cycle. Just over a week ago I travelled up to the regional city of Bendigo for a music event with some old friends. I took the train to enhance the adventure. By getting out of town and away from the computer I managed to disrupt my usual routine, which enabled me to step back and think about the direction this site needs to take over the next 12 months. It’s ironic that a little bit of travel and a single night in the country was all that was needed. Over the last year or so I tried writing blog posts at different times of day. I think I started to find a good daily rhythm around six weeks ago. Since then I’ve been able to fit thirty to sixty minutes of walking in most days of the week. These near daily walks have been great for both mind and body; and I feel I’ve been able to bring an extra level of clarity to planning how to move forward with my creative endeavours. It’s another example of how a planned disruption has enabled me to sufficiently separate myself from the day to day routine of running this site. An abstract detail of a waterfall, under evening light, in Iceland. The spaces I’ve created are like fresh air to a drowning man. I’m now able to take a look around, recognize what’s great about this website and blog and look at new ways to improve it. Let’s be clear, this remains a solo show with me as the author and content producer. Nonetheless, the separation that I’m referring to has allowed me to look at this site, and in particular, the blog from a distance. The result is some objective observations about how it looks and works and what I can start implementing to make it an even better blog into the future. What I’ve learned along my own creative journey is to make changes that are in line with your core beliefs, values and desired outcomes. That can only help you stay true to yourself and your greater purpose in life. Wouldn’t you agree? 2016 was such a busy year for me, with a particularly heavy online teaching role at The Arcanum. The compromise was that I had little time to blog and, as a consequence, the frequency of blog posts on this site dropped right off. At the beginning of 2017 I decided it was, once again, important to make a major commitment to blogging and I've done so with great gusto, usually posting on a five day a week schedule, sometimes with several posts on the same day. During 2018, in addition to keeping up this heavy frequency of blogging, I spent a great deal of time working on the design of the site to make it more visually attractive and easy to navigate. I'm very happy with the changes and believe that your experience of this site has been greatly enhanced as a result of all that work. The fact is that there are many ways that you can connect and absorb the information I produce on this site. The blog will remain the centre piece of my online identity, but it's time to branch out into other areas. The reality is some folks prefer to connect outside of the blogosphere. I’II continue to blog regularly but, right now, I’m thinking of reducing the frequency of posts to around three per week. But I’II be challenging myself to make each post better than what I’ve achieved in the past. Continuing a trend, I’ve established over recent times, most posts will be longer with more photos and with more variety in the content of the text. I’m still figuring out exactly what this means, but here’s what will remain unchanged. Here’s what I’m thinking of adding into my blog posts. I think it's time Travel Photography Guru began to transition from a travel photography blog/website into a brand. The trick for me will be to remain flexible and responsive. That's bound to keep it fresh and fun. My long touted podcast is, finally, about to be launched. I’II share all the information with you over coming days. I’m also about to open an online photography community on Patreon. After a few weeks with a select bunch of participants I’II open it up to the wider world. If you’re a regular visitor to this site, you’ll be the first to know. 2019 is going to be a great year and I’m very much looking forward to increasing engagement and interaction through my podcast and online photography community. Please stay tuned for all the details.